This month’s gardening goal? 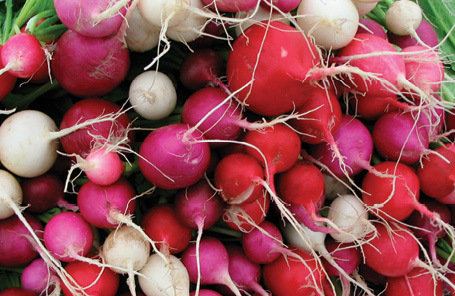 Get quick- and easy-to-grow spring radish seeds in the ground while daytime temps average around 50°F to 60°F. Keep things interesting by picking several varieties, such as ‘French Breakfast,’ ‘Crimson Giant,’ and an ‘Easter Egg’ seed blend (see below). In a sunny location, plant the seeds directly into light, well-draining soil (preferably with a pH of 5.8 to 6.8), at a depth of one inch, spaced about four inches apart. Be sure to keep the soil moist throughout the growing season. 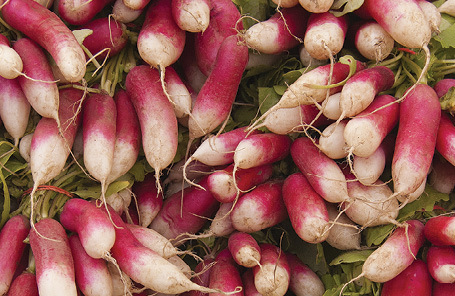 As a general rule, radishes are ready to be unearthed when they’re about an inch in diameter, though exact sizes depend on variety. The versatile veggies can add a spicy bite to salads or sandwiches, be roasted with herbs for a yummy side, or pickled for year-round enjoyment. ’French Breakfast‘: This heirloom variety’s elongated, scarlet-red root (reaching about 1¾ inches long and 3/4 inches wide) fades to white toward the tip. It has a crisp, delicate flavor and looks lovely served whole for snacking. 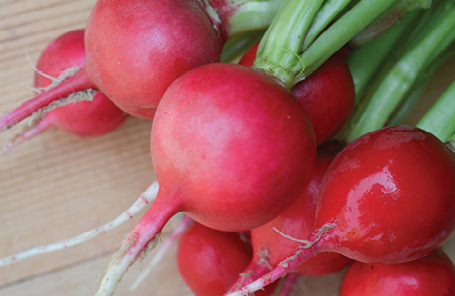 ‘Crimson Giant‘: Growing to a larger size, this radish retains its mild flavor when harvested at 1½ to 2 inches in diameter. It boasts the more traditional bright red exterior, which contrasts beautifully with the crisp white interior. ‘Easter Egg‘ Blend: Plant a rainbow of color—including serene white, rosy pink, vibrant purple, and brilliant red—with this crowd-pleasing seed combo. Harvest when the radish is no larger than 1½ inches in diameter.